competitions by real-time, in-stadium fan voting on their smartphones. social channels: Facebook, Twitter, Instagram and YouTube. 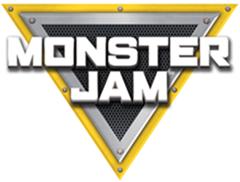 ORLANDO, FL (September 19, 2017) – Feld Entertainment announced today that tickets for Monster Jam® are now on sale. Monster Jam will be performing at Camping World Stadium in Orlando on Saturday, January 20, 2018. Gates open at 5 PM, and opening ceremonies and racing start at 7 PM. Monster Jam® is adrenaline-charged family entertainment providing jaw-dropping displays and gravity-defying feats that promise to always leave fans entertained. Monster Jam events feature some of the most recognizable trucks in the world including Grave Digger®, Max-D, El Toro Loco® and many more. 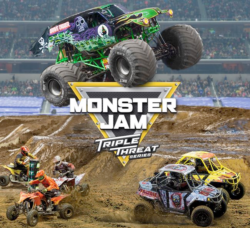 World-class drivers push these perfectly-engineered Monster Jam trucks to their limits in Freestyle, “2-Wheel Skills” and Racing competitions that will put families on the edge of their seats and leave them craving more of this unexpected, unscripted andunforgettable event! New in 2018, the Pit Party Early Access Pass is available to every fan who purchases a ticket to the event. The pass provides early entry into the Pit Party from 1:30 PM – 2:30 PM and serves as the regular Pit Party pass from 2:30 PM – 5:30 PM. Monster Jam drivers will depart from the Pit Party at 5 PM. The Pit Party Early Access Pass must be accompanied by an event ticket and quantities are limited. Monster Jam Returns to Orlando on January 25th, 2014! Show Time: One show only: Saturday, January 25th 0 Gates Open at 5 pm. Opening Ceremonies at 6:30 pm. Racing Starts at 7 pm. Ticket Prices & Purchase: Advance purchase SuperValue Tickets are ONLY $15. $35 VIP / $25 Sideline. Tickets are on sale now at all Ticketmaster outlets, the Amway Center Box Office, or charge by phone at 800-745-3000 or ticketmaster.com. Tickets will also be available day of show at the Citrus Bowl. All seats reserved. Subject to facility fee, plus convenience and handling charges. Don’t wait – buy tickets in advance as prices go up $5 more the week of show. Get more show information at www.MonsterJam.com (click on “Tickets” and search for Orlando January 25th). competition where each monster truck gets up to 120 seconds to “wow” the crowd with huge jumps, wheelies, truck-spinning donuts, flips, and the destruction of cars, vans, buses, motor homes and more. Four-time World Champion, Dennis Anderson, returns to his favorite city driving the legendary monster truck he created 32 years ago, GRAVE DIGGER. After his sensational 2013 debut, Ryan Anderson will be joining his father driving SON UVA DIGGER. The event will also feature 11-time and reigning World Champion MAXIMUM DESTRUCTION, plus Latino favorite EL TORO LOCO, MOWAWK WARRIOR, ICE CREAM MAN, MONSTER MUTT ROTTWEILER, the Orlando debut of Nicole Johnson driving SCOOBY, and more yet-to-be announced motorsports competitors. The official title of the event is Metro PCS, 1-800-Ask-Gary, Budweiser & Your Southern Ford Dealers present MONSTER JAM®. Preview/Opps/Contests: Fans can go behind the scenes, meet the drivers for autographs and photo ops, and see the monster trucks up close at the World’s Ultimate Pit Party at Tinker Field from 2-5 pm. Purchase a pit pass for only $10 more when buying tickets at Ticketmaster or the Amway Center Box Office. Or, pick up a free pit pass at participating Orlando area Southern Ford Dealers beginning January 6th (while supplies last). Pit Passes, along with a valid event ticket, get fans into the Pit Area. Fans can also have the opportunity to ride in a real monster truck before the show between 1-7 pm in the lot across from Gate D. Monster Truck Rides are $10 per rider. “Shaquille O’Neal Presents: All Star Comedy Jam – Live From Orlando” is the fourth time that Shaq has presented these hilarious comedy specials. In the previous specials he has showcased the following amazing talent including, Cedric the Entertainer, Kevin Hart, Tommy Davidson, Mo’Nique and D.L. Hughley. This time around Gary Owen known best for his roles in the film “Think Like A Man” and TV series, Tyler Perry’s “House of Payne”, hosts this latest installment. Shaq has also personally handpicked some of stand-up comedy’s most talented comedians including Capone, Lil’ Duval, Tony Roberts and Jay Pharoah. If you are looking for some laugh-out-loud laughs…look no further. Media Mikes had the privilege to chat with Gary Owen and he is one of comedy’s best comedians, click here to check it out! “All-Star Comedy Jam – Live from Orlando” was filmed at Hard Rock Live in front of a live audience in Orlando FL and you can just feel the energy during this show. The only bad thing about this release is that it is just over an hour, I would have loved to see this expanded longer. I would have also expected extended sets on the extras. Though they are also not available on the extras. The special features included are a “Backstage Jam” behind-the-scenes featurette, which is some fun stuff. Lastly there are also some trailers included. Hey Shaq, when’s the next one coming out? ORLANDO, Fla. – September 19, 2012 – Feld Motor Sports has released a special offer for its 2013 Advance Auto Parts Monster Jam® events at the Florida Citrus Bowl Stadium on Saturday, January 26th, 2013. For one week only, Monday, September 24 through Sunday, September 30, 2012, fans who purchase any Orlando 2013 show ticket will receive a free Pit Pass with every ticket purchased. Pit Passes are normally $10 each and are good for admission to the “Party in the Pits,” which takes place 2 to 5 p.m. before the show. The pass takes fans behind the scenes to meet the drivers, obtain autographs, get a close-up view of the monster trucks, see special entertainment, take part in games, and more. A show ticket is required along with a Pit Pass for entry into the pit parties. The January 26th Orlando show starts at 7 p.m.
Tickets start at $15. The free Pit Pass offer will be available for purchase at the Amway Center Box Office, through www.Ticketmaster.com or charge by phone at 800-745-3000 (offer not available at Ticketmaster retail outlets) starting Monday, with the offer expiring at midnight Sunday, September 30th. Compete event information is available at www.MonsterJam.com. The official title of the event is Metro PCS, 1-800-ASK-GARY, Budweiser and Your Southern Ford Dealers present the Advance Auto Parts Monster Jam®. “Pearl Jam 20” directed by Cameron Crowe tells the story of one of rock more outspoken groups Pearl Jam. This documentary follows the band through its inception nearly 20 years ago. Through new interviews and archival footage you get to see and hear firsthand accounts of the trials and tribulations of one the most popular bands to come out of the 90’s grunge era of music. Pearl Jam is a band I grew up listening to and I was quite intrigued to hear their complete story. The film does a great job leaving no stone unturned starting with Stone Gossard and Jeff Ament’s previous band Mother Love Bone. Gossard and Ament tell the story of how the passing of their singer led to Eddie Veder coming into the fold and forming a new band. There were a lot of great archival clips that I remember reading about or seeing when they initially happened. I found this very reminiscent. The film was very truthful and the expressions of those in the film proved that. Even when the topic of the controversial Ticketmaster incident was discussed no member shied away. In fact each person provided their perspective of those events based on where they are now. On a personal note I really enjoyed the stories and footage related to the Temple of the Dog album which featured both Pearl jam and members of Sound Garden. Director Cameron Crowe definitely delivered with this film. The interviews were all very candid and again nothing seemed to be cut or left out. Seeing the members of the band in their natural environment during their interviews brought a real independent feel to this film which almost echoes the bands very being. “Pearl Jam 20” is a must see!